What is a Scissor-Switch Membrane Keyboard? Scissor-switch membrane keyboards are a distinct subset of rubber dome switch keyboards, which merit their own category due to their widespread use in laptop and other portable keyboards. This keyboard still utilizes rubber domes, but a special plastic 'scissors' mechanism links the keycap to a plunger that depresses the rubber dome with a much shorter travel than the typical rubber dome keyboard. Typically scissors switch keyboards employ the same standard 3-layer membranes as the electrical component of the dome membrane switch. The smaller, shallower footprint makes scissor-switches popular on laptops and other portable keyboards. What are the Characteristics of a Scissor-Switch Membrane Keyboard? Key Travel Distance: Scissor-switch membrane keyswitches are not 'full-travel' and typically have a key travel distance of 1 - 2.5 mm as compared to 2.5 - 4 mm for membrane keyboards. As such, when typing on these keyboards it is almost impossible to prevent 'bottoming out' on every keystroke. Noise Level: Scissor-switch membrane keyswitches are noisier than regular membrane as the physical characteristics of the switch reduce the amount of rubber or silicon in the switch, reducing the 'cushioning' that is available. 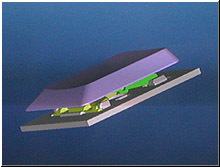 In addition the scissor mechanisms help to optimize the elasticity of the rubber, resulting in a distinct noise when keys return to the original 'up' position that is not a factor on dome membrane keyboards without scissor-switches. Durability: Most standard scissor-switch keyswitches are rated at 5 million keystrokes, however some manufacturers use superior materials and have ratings of as high as 10 million keystrokes. They are harder to clean than dome membrane keyboards (due to the limited movement of the keys) but also less likely to get debris in them as the gaps between the key cap tops are often less. This is because there is no need for extra room to allow for the 'wiggle' in the key as you would find on a membrane keyboard. Key Activation Force: The 'factory' actuation force varies widely, and can be as low as 65 grams or as high as 100 grams. Most scissor-switch membrane keyswitches are rated between 65 and 85 grams. Tactility ('Feel'): Most scissor-switch membrane keyswitches have a crisper more tactile feel than regular dome membrane keyboards. They also feel more solid as they are stabilized by the scissor-switches which prevent side to side or twisting movement during key travel.